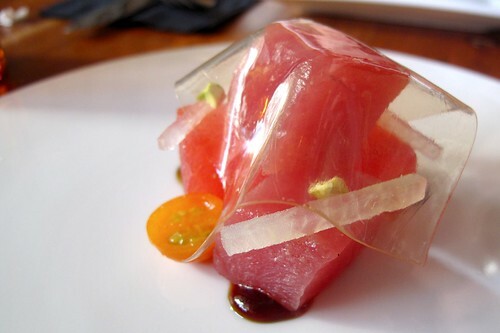 The best part of this dish was the similar visual appearance of the cubed raw tuna and fresh water melon. The transparent cherry tomato water film and the tiny pieces of pistachio didn't really add much for me. 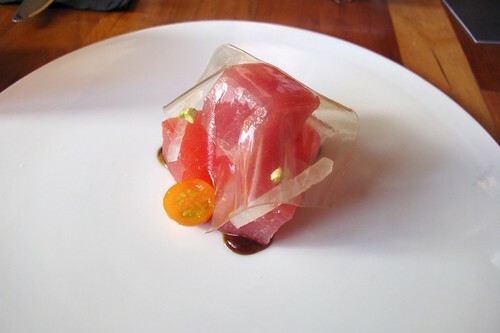 What stood out was the contrast in texture and flavor between the sweet, crunchy watermelon and the soft tuna with "umami" droplets of soy sauce. 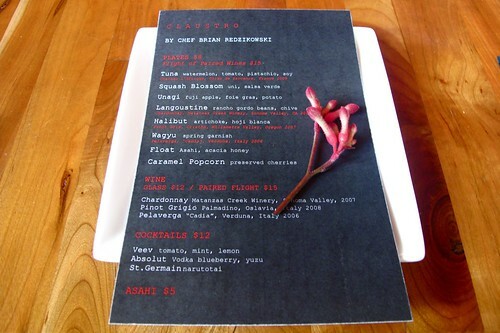 The idea was smart and playful, though the flavor combination was nothing new. 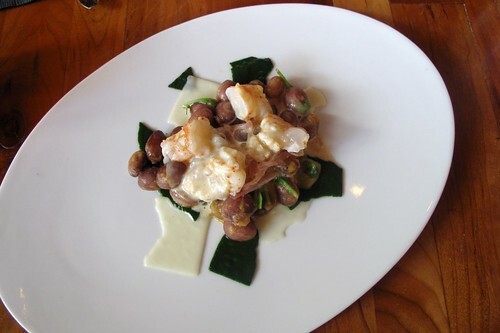 I really wanted to like this dish. 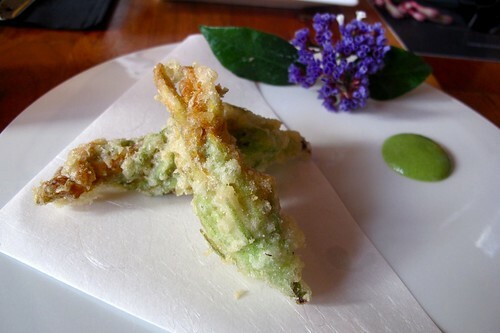 I love fried stuff fried squash blossoms and I LOVE uni. Sadly, it did not live up to my expectations. 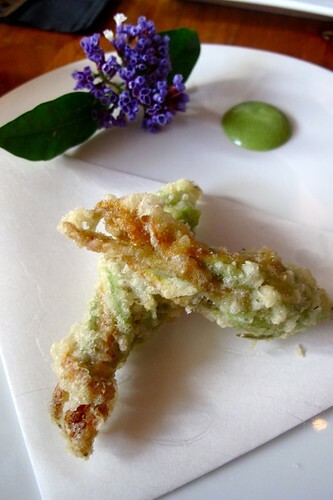 What stood out immediately was the creamy mouth-feel of the stuffing, then taste of oily fried batter, and finally at the end you get a slight hint of the uni flavor...and I mean slight. The salsa verde added a nice slightly spicy component to the dish. 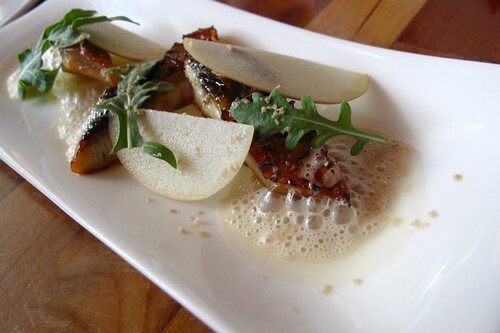 This dish was interesting because I've never had unagi with potato. I have to say, it's a good idea. 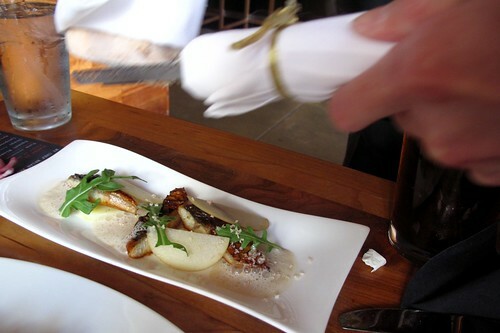 The potato made the eel taste creamier and even fattier. 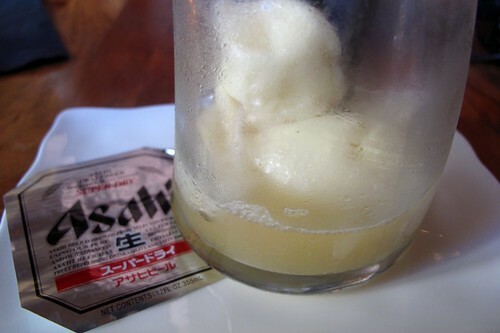 I've also never had shaved frozen foie gras. 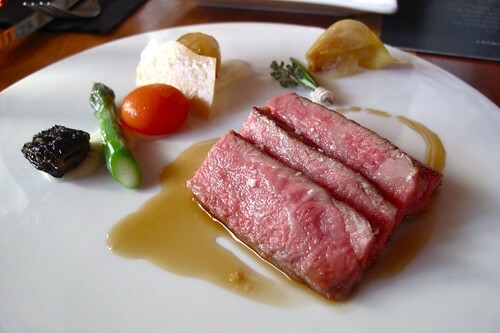 A large block of frozen foie was "zested" with a microplane onto the dish at the table. 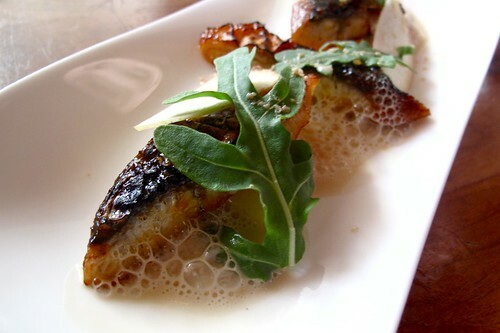 The little sprinkling of foie added another rich, unctuous layer of flavor when mixed with the creamy sauce underneath. I can't say I really noticed the thin slices of apple, though it was a nice idea. I was not impressed by this offering of langoustine. In fact, I was pretty disappointed. 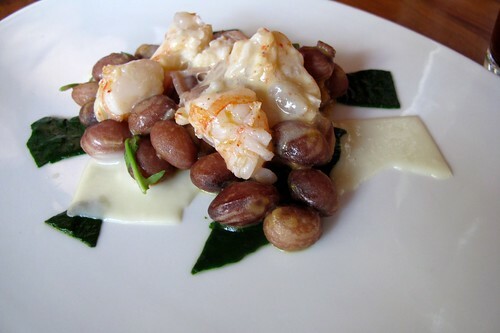 The texture of langoustine was off--instead of sweet and snappy, it was more mushy than anything. Mushy is not a word you want associated with seafood. At first glance I thought the beans were boiled peanuts and I got excited. Turns out, they weren't peanuts and they weren't particularly exciting. 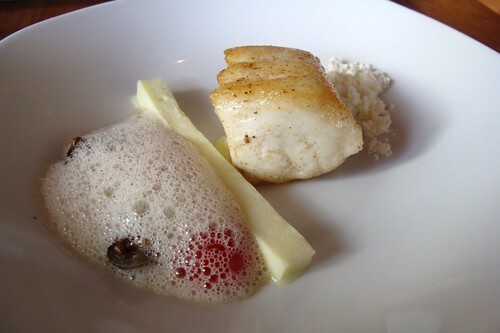 The halibut was severely under-seasoned and actually kind of dry. 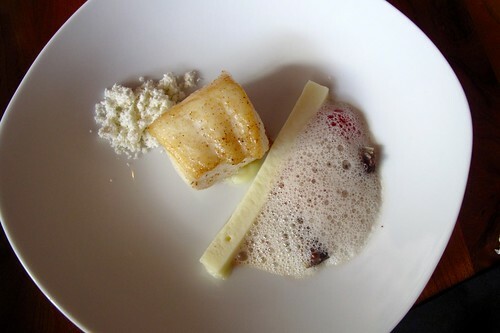 The olive oil three ways--powder, pudding, and foam--is the only thing worth noting in this dish. 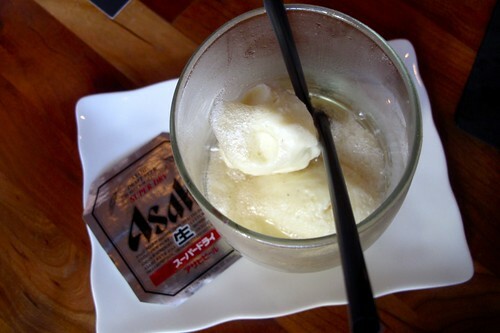 Even so, the powder had no flavor and the foam was just there, but thankfully, the strip of olive oil pudding was fairly interesting. 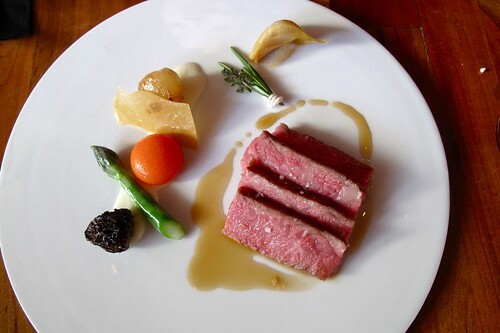 Beautiful presentation of marbled steak with dainty accompaniments of morel, asparagus, carrot spherification, a French onion soup chip, pearl onion, a cute miniature twine-tied bouquet garnis, and a giant clove of roasted garlic. 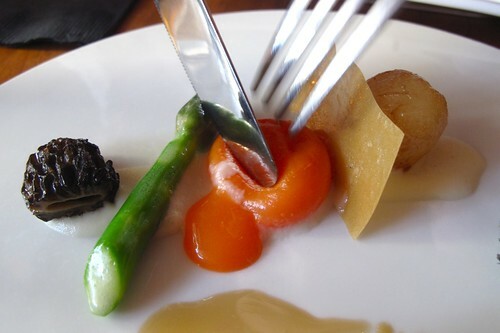 We were instructed to break open the carrot spherification and use the carrot purée inside as a sauce. Sadly, the beef wasn't as tender or melt-in-my-mouth fatty as I was expecting, but the sweet caramelized onions hidden underneath beef were deliciously sweet. The whole dish had flavors of a French onion soup, and it's safe to say, the vegetables out-shined the meat. The second dessert of the night was also very good. Redzikowski clearly excelled in the dessert department that night. 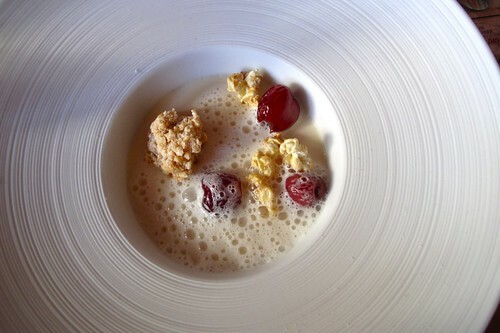 The caramel panna cotta was delicious and reminded us of cereal milk. 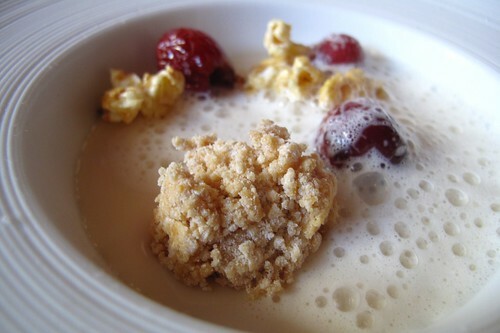 The popcorn foam and actual pieces of caramelized popcorn were very pleasant--thankfully, the popcorn wasn't soggy. The caramel powder stuck together and reformed into a sticky blob of sticky sweet goodness. The preserved cherries went surprisingly well with the rest of the flavors. 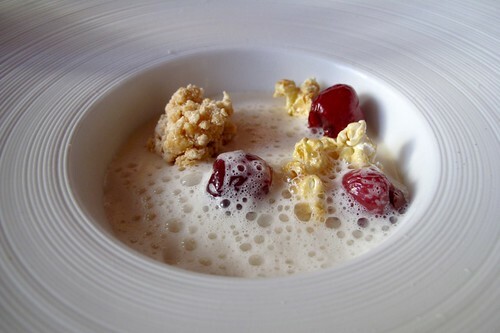 I loved everything about this dessert. So impressed by these photos given how quickly you take them. Props, Christina! 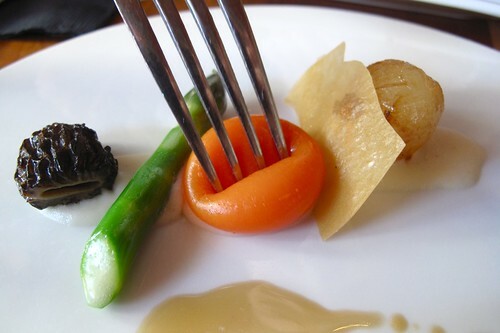 I quite like the concept, creativity, and plating Redzikowski demonstrated here. It's too bad that execution on some of the courses didn't realize that full potential. Those are some awesome pics, the tuna is particularly striking. 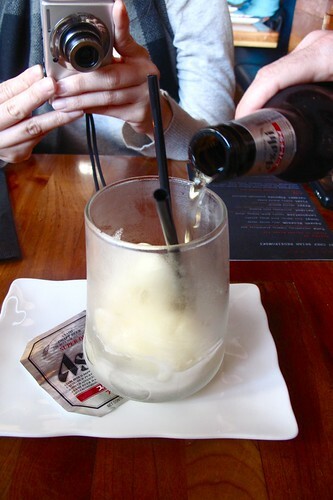 cannot imagine how would the Asahi beer float taste like..